'Grow your way to a five a day'! This seems to be the motto for more and more families in Cam. We currently have 5 sites in Cam, at Woodfield, West End, Upthorpe and Ashmead, and each site has varying sizes and numbers of plots. The price of an allotment is £25 per year for a full size plot and £14 for the smaller half plots. Ashmead 1 is a long established allotment set in beautiful countryside in the Cam Green area of Cam. One side runs adjacent to Ashmead Road, two sides border back gardens and the final side backs onto fields. This beautiful allotment site consists of nine allotments with two taps supplying mains water. It also has a noticeboard fitted that allow allotments holders to communicate with each other and Cam Parish Council. Ashmead 2 allotment is further along the road from Ashmead 1 and is on the border between Cam and Coaley Parishes. This allotment site is set in stunning countryside with amazing views. Upthorpe allotment site is surrounded by hedgerow and is located at the bottom of Upthorpe towards Station Road. It is a small allotment site consisting of eight allotment plots with two taps supplying mains water. It has a noticeboard fitted allowing allotments holders to communicate with each other and Cam Parish Council. 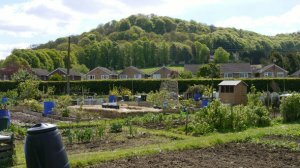 Westend allotments is situated in a semi-rural location, surrounded on 3 sides by back gardens and woodland. It a small allotment site consisting of 24 allotments with five taps supplying mains water. It has a noticeboard fitted and has a chain barrier fitted to allow access for wheelbarrows from the main road. Woodfield allotments is Cam Parish's largest allotment site. It is surrounded by roads on two sides, Woodfield Road and Marment Road and the remaining side backs onto rear gardens. This large allotment consisting of 28 allotments with four taps supplying mains water. It has a noticeboard fitted that allows allotments holders to communicate with each other and Cam Parish Council. The criteria for becoming an allotment tenant is very simple, you just have to reside in Cam! You can check out the rules and regulations for allotment holders below. Allotments for hire and where they are. 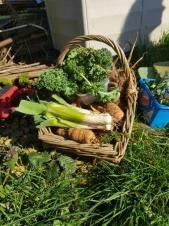 Cultivating your allotment - how not to get a grumpy letter from the Council!